Welcome to Mooshäusl, a former inn. This unique property offers room for up to 40 people, spread across more than 500 m2. Groups, multiple families or even two football teams plus their coaches will find plenty of space here. The bathrooms have been modernised and updated to the latest standards. Thanks to its ample dimensions, the dining area is also an inviting place for large celebrations. The basement level contains a sauna with accompanying relaxation room. 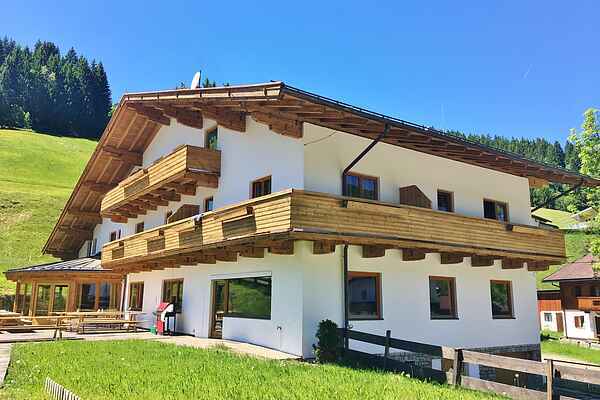 The true highlight of this accommodation is the ski lift located directly next to the property. That means you can ski in and ski out in winter. Straight from the slope to the sauna and vice versa. The Kelchsau is a very attractive holiday destination in summer as well. Hiking, cycling, golfing, rafting or simply swimming in pristine bathing lakes you will find it all here. Thanks to the excellent geographic location, you can be in Kitzbühel, Wörgl, Salzburg, Munich and even Italy in no time at all. Active holidaymakers and anyone looking for a unique experience will find a very warm welcome here.